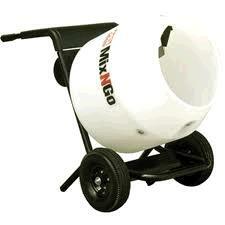 Small portable wheelbarrow-style electric mixer. Works great for basement projects, fence/deck footings, or other small projects! Will roll through a 30" door opening. Convenient! Can dump concrete right in hole after mixing. * Please call us for any questions on our mixer cement 3 cu ft electric rentals, in Fairmont MN, serving Southern Minnesota and Northern Iowa.